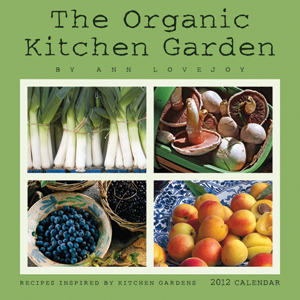 The Organic Kitchen Garden 2012 Wall Calendar is a perfect companion to every cook’s kitchen. Featuring beautiful photographs of kitchen gardens and the lush produce they offer, this calendar pairs images with twelve months of recipes and tips inspired by the bounty of kitchen gardens and the local farmers market. Each month offers a simple, seasonal and healthful recipe along with tips on growing, harvesting, canning and cooking – all with an emphasis on the importance of an organic approach. 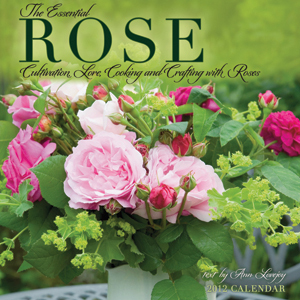 Discover the romance of the rose with The Essential Rose 2012 wall calendar, artfully crafted by writer Ann Lovejoy. Stunning photography, recipes, tips on cultivation, as well as crafts, herbal remedies and the fascinating history of this magnificent and captivating flower will enchant all year long. I love your column/blog, how nice to be able to ask questions and comment on your observations and knowledge. As I sit at my computer, a heavy downpour is happening outside… so going to the studio will have to wait a few minutes. This past fall we planted many daffodils and they are now near done blooming, do I cut down the blossoms, the whole plant, fold and tie the leaves or let nature take it’s course? Wondering about the tulips too..
Once daffodils are spent, snap off the flowerheads with your fingers to keep them from making seed pods (that depletes the plant). Let bulb foliage ripen and turn brown before cutting it back, because as the foliage dries up, important nutrients are stored in the bulb and help create next season’s blooms. Same general idea for tulips; after petals fall, snip off the stem tips and let the bubs go dormant naturally. Don’t fold, braid or otherwise mutilate the foliage, since that impairs nutrient transfer. Instead, interplant some ferns that will rise up as bulbs fade and hide the dying foliage. Lacy native lady ferns come up often in our gardens and can be transplanted easily, so I often use those. Hostas work well too. Hope that helps! I am responding to this e mail because I did not know how to get in touch with you to ask a question. 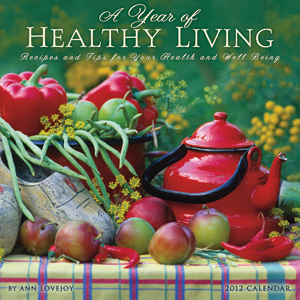 Every year I order your Calendar “A Year of Healthy Living”. It was not available anywhere this year. I loved this calendar with the weekly affirmations, etc. Please, are you no longer having this calendar published. Is there any calendar you would recommend. P.S. I hope Diane doesn’t mind I posted this on her letter. I too was sad that Amber Lotus is no longer publishing that calendar, which I loved making each year. They do still publish my Organic Kitchen Garden calendar, not the same, but lots of good vegetarian recipes and hints. Hope you can find something similar someplace! I loved the daily phrases spread through the the 2014 Healthy Living calendar. In fact I loved them so much that I just finished cutting them all out to keep in a jar to draw from for daily reminders. Thank you for putting together such a beautiful and well rounded calendar. It was a welcome addition to my home and I wanted to thank you. Thanks, Kelly! I try to make those little reminders real and take them from my own daily life. I seem to need a lot of little nudges to keep myself from wandering off track, and I prefer gentle, kindly reminders to militant ones. I’m so glad that you find them helpful too! Love you Wall Calendars Ann. Thank you. I have bought them for several years now and just love the little affirmations. I feel like you seem to write just what I need at that moment. Thank you again. Well, thanks! I try to make them “real” so they apply to my own life, and I’m glad to hear you find them helpful too! Hi Ann, not a comment about calendars, but just to say I accidentally found your site when I was looking for a non toxic way to clean the curly grey moss that likes my wooden garden chairs…good old baking soda! Thanks, Susan, I’m glad you find your way here, and hope you enjoy the wide-ranging topics. Let me know if there’s anything special you’d like to read about and I’ll try to oblige! Hi Becky, sadly, that’s right. 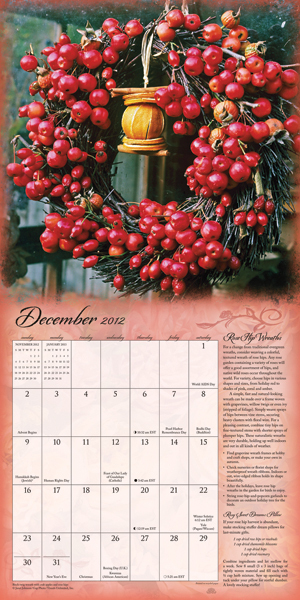 I miss it too; YHL was my favorite of the calendars, though all are great fun to develop. Hopefully you’ll find some similar thoughts and discoveries here…and bless you for your kind words, they are much appreciated! I can’t find any current (2019) information about your Organic Garden Calendars, so am I assuming correctly that they are no longer being published? I’ve been buying them for years and beautifying my kitchen with them. Can you update me about your calendars? Sadly, Amber Lotus is not longer publishing my calendars. I miss them too! It was such a pleasure to create the recipes and garden tips that went into them, but I offer very similar information and ideas on this blog, so hopefully you’l find things to enjoy here too. If you ever have specific questions, just let me know! I’m so disappointed that there’s no 2019 calendar. I will start following your website but I’m so going to miss a new calendar. Any hopes that some other publishing firm will fill the gap? Hi Marge, I’m also disappointed but apparently calendar sales are shrinking as so many people use a calendar function on a device instead of a paper one. I loved the wonderful images and really enjoyed developing the recipes and crafty ides as well. I still do both of those things and offer them here, so hopefully you can browse the blog site and find things that interest you. And if there’s something specific you’re looking for, you can always ask and I’ll try to be of help! I understand you are not publishing the organic kitchen calendar this year, I just want to say I have really enjoyed over the years and will really miss it not being a part of my kitchen in 2019. thank you so very much for all the years you graced us with this wonderful calendar. Thanks! I too am sad to see them go but the publishers made the decision. However, if you follow this blog, you may find similar ideas and recipes here as well. And feel free to ask questions! Thanks, I miss the calendars as well, and I hope you may find similar ideas and recipes here in this blog. You are welcome to ask questions any time!